All County Paving’s National Paving program is designed to provide exceptional quality control and timely cost saving maintenance. Our experienced team have provided the highest quality paving services national brands for many years. We think you’ll find our Pavement construction, maintenance and repair systems to be thorough, detailed and cost effective. Our system is broken down to best serve the needs of large national brands. Team of 8 Project Managers Dedicated to Capital Projects. Required 80+ Hours of training with VP of National Operations and other seasoned Project Managers. Completes minimum of 2 projects with another Certified PM before managing a Capital Project alone. Each PM is trained on the specific process of each client individually and a reference guide is sent in the job binder for each individual project to ensure 100% compliance with the client’s requirements. Morning safety meetings where OSHA and various other safety bulletins are covered both at the yard before the crews leave as well as on the job site before any equipment is started. Each project has a job binder that is on site with every detail of the job (plans, checklists, daily requirements, etc.) available for the PM to reference as well any representative of the client to use as a reference during onsite visits. 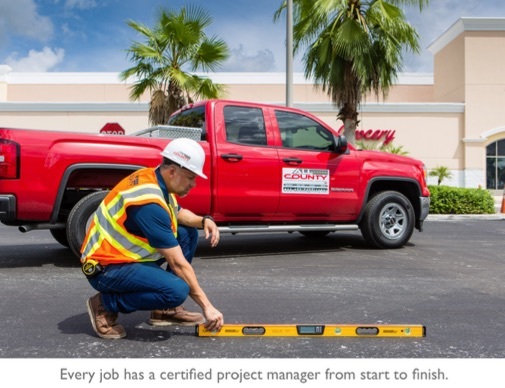 Prior to job beginning, the All County Project Manager will check irrigation system, parking lot lighting, and cart corrals to ensure that there is no existing damage prior to the job. We will update the SFT/STL at the beginning and end of each day to communicate the exact locations that we will be working for the current day and following day. We will have a laminated site map posted at each location in the employee break room to communicate up to the minute changes with the SFT/STL as well as the store team. This map enables us to keep communication with each and every employee so that they can be prepared to communicate what areas of the parking lot will be impacted each day to the store guests. Ensure that every entrance to the location is easily accessible and every area close to any entrance that is being worked on is clearly marked with directional signage and barricaded for guest safety. Additionally each phase of the project will be documented daily with photographs to be uploaded into the target system and/or emailed to the proper contact with all proper depths and requirements clearly visible. 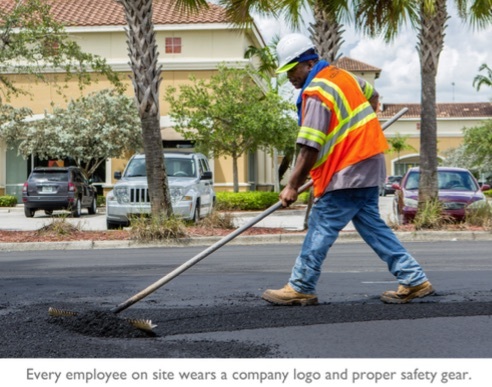 Our National paving team has performed work for many of the top brands across the country. Below is a list of a few great companies we’ve worked with. Our leadership and management team are recognized as the best of the best. 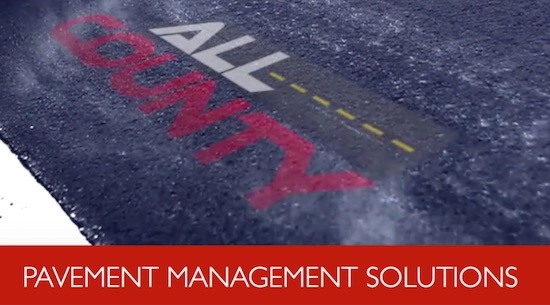 Contact us today to discuss your Pavement needs and discuss how All County Paving can help you reach your goals. 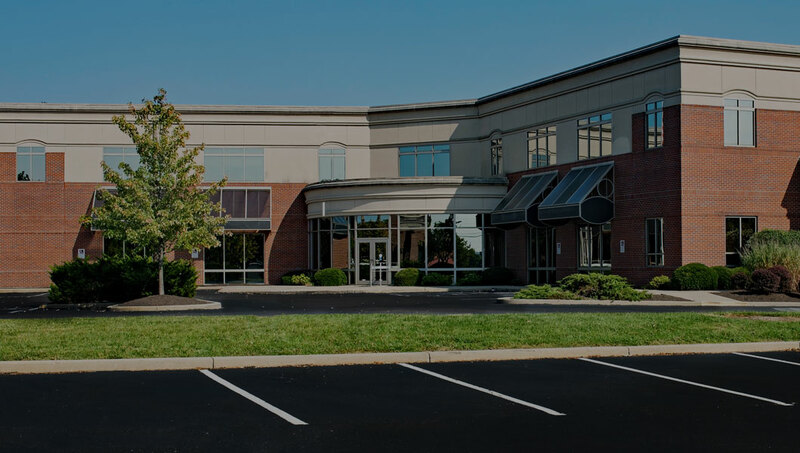 Over 20 years of leadership experience primarily in the finance and construction industries. 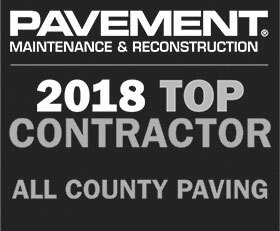 Recognized Paving, Grading, and Concrete Equipment expert.